Nightfall comes to Launch Complex 39B at NASA's Kennedy Space Center in Florida on Oct. 23, 2009, as xenon lights reveal the Ares I-X rocket awaiting the approaching Oct. 27 liftoff of its flight test. This is the first time since the Apollo Program's Saturn rockets were retired that a vehicle other than the space shuttle has occupied the pad. CAPE CANAVERAL, Fla. - NASA's brand-new rocket, the vehicleplanned to launch astronauts spaceward after the space shuttles are retired, ispoised to make its first-ever test flight Tuesday. 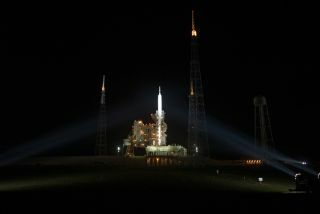 The experimental AresI-X rocket is set to lift off at 8 a.m. EDT (1200 GMT) from Pad 39B here atKennedy Space Center. NASA needs good weather in order to gather detailed dataon how the $445 million booster performs during this maiden voyage. Unfortunately,weather officer Kathy Winters has predicted a grim 60 percent chance of cloudsthwarting a launch attempt Tuesday. "The weather is a little bit of a concerntomorrow," Winters said Monday. Ares I-X isa trial version of the Ares I rocket, planned under NASA's Constellationprogram to ferry astronauts to low-Earth orbit aboard an Orion spacecraft. Thetest rocket includes a real solid-rocket first stage, with a mock second stageand dummy Orion crew capsule on top to simulate the intended weight and size ofAres I. Ares I-X is thetallest booster in service or about to fly and stands about 327 feet (100meters) high ? 14 stories taller than NASA's space shuttles. The test flight comes at an uncertain time for NASA. Theagency?s plans to use the Ares I rocket and Orion capsules to replace theshuttle fleet and return astronauts to the moon by 2020 are under review byPresident Barack Obama?s administration. Last week, a report from anindependent panel appointed by the White House suggested that NASA considerscrapping the Ares I rocket in lieu of commercial rockets that could be readysooner. Despite the uncertainty, NASA officials said they standbehind the flight test, which should be useful not just for designing Ares Ibut also for other future rockets. "Much of that kind of learning will be applicable toany large-scale launch system," said Jeff Hanley, program manager forNASA's Constellation program, which encompasses Ares I and Orion. NASA hopes to have the Ares I and Orion vehicles in serviceby 2015, but the White House panel said that date would likely slip to 2017. As an untried rocket, the flight does carrysome risk, mission managers said. "We're not going to guarantee this is going towork," said Steve Davis, Ares I-X deputy mission manager. "This is aflight test. We have very high confidence it's going to work but there's someareas we're testing for the first time, and that?s why we're doing thetest." If the rocket were to fly sharply off-course and threatenedto pose any danger to the public, an explosive mechanism onboard called therange safety system could be initiated to destroy the booster. "[We'll] make sure that were providing safety to thepublic," said Ed Mango, Ares I-X launch director. "There's no chancethat this vehicle is going to go anywhere where the range can't take care ofanything it needs to." Also adding to the potential hazard of the flight is thefact that the space shuttle Atlantis is currently poised atop its Launch Pad39A, a mere 1.6 miles (2.5 km) away. If Ares I-X were to explode, the nearbyspace shuttle could be in jeopardy. However, because of the trajectory plannedfor the rocket, as well as the high level of confidence that it will workgenerally as planned, NASA has estimated a slim 1-in-10,000 chance ofcatastrophic damage to Atlantis - a danger level the agency is willing toaccept. In fact, mission managers say their biggest fear now isthe weather. When asked if any issues were keeping him up at night inadvance of the flight, Ares I-X mission manager Bob Ess replied "mostlythe weather." Because this is the first launch of its kind, and a majorgoal is to photograph and videotape the rocket's performance, NASA requirespristine skies and clear visibility to loft the booster. Furthermore, thelaunch is constrained by the risk of a phenomenon called"triboelectrification," which could occur when the rocket passesthrough clouds and triggers static electricity that might interfere with theinstruments onboard. This is not a concern with space shuttle launches, whichhave been proven immune to this occurrence. Ares I-X has a four-hour launch window, from 8 a.m. to noonEDT (1200 to 1600 GMT), and it only needs about 10 minutes of clear skieswithin that time to launch. If the rocket cannot blast off on Tuesday, NASA cantry again during the same window on Wednesday, when weather conditions areexpected to improve. NASA will begin counting down toward theplanned liftoff at 1 a.m. EDT Tuesday, with a live television broadcast tobegin at 5 a.m. Despite the inherent uncertainty in Ares I-X's flight,mission managers said they are as confident as possible. "We're in great shape, the vehicle's ready to go, andcertainly all of us are really excited about Tuesday's launch," said NASAtest director Jeff Spaulding during a Sunday briefing. The rocket is slated to launch skyward, but stop short ofreaching orbit, before falling back down to Earth. The entire mission isplanned to last just over two minutes. During that time over 700 sensors onboard will feed backmeticulous measurements of the rocket's path and performance, while cameras onthe ground and aboard airborne planes will take photographs to chart itstrajectory. "Our purpose is to validate the design and gainpractical experience with the vehicle," Davis said. "The goal of thetest is to get information, it's all about learning. The only failure on thisflight is a failure to learn from it." SPACE.com will provide full coverage of NASA's Ares I-Xtest flight with Staff Writer Clara Moskowitz in Cape Canaveral, Fla., andManaging Editor Tariq Malik in New York. Clickhere for live launch coverage and mission coverage. Live updates beginTuesday at 5 a.m. EDT (0900 GMT).